Echo Alkaev’s safe and carefully structured world falls apart when her father leaves for the city and mysteriously disappears. 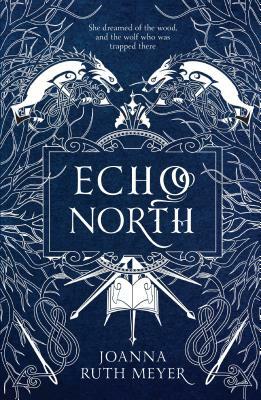 Believing he is lost forever, Echo is shocked to find him half-frozen in the winter forest six months later, guarded by a strange talking wolf—the same creature who attacked her as a child. The wolf presents Echo with an ultimatum: if she lives with him for one year, he will ensure her father makes it home safely. But there is more to the wolf than Echo realizes. In his enchanted house beneath a mountain, each room must be sewn together to keep the home from unraveling, and something new and dark and strange lies behind every door. When centuries-old secrets unfold, Echo discovers a magical library full of books- turned-mirrors, and a young man named Hal who is trapped inside of them. As the year ticks by, the rooms begin to disappear and Echo must solve the mystery of the wolf’s enchantment before her time is up otherwise Echo, the wolf, and Hal will be lost forever. "A ravishing new fairytale woven of music, enchantment, and mystery. Readers will be riveted by Meyer's poignant voice and masterful storytelling, and fall in love with Echo's courage." "A gorgeous retelling set in an immersive world with deeply satisfying mythic undertones. Meyer imbues her fantasy with a classic sensibility and gravitas that are often missing from modern works." We're thrilled to announce that starting Monday, March 25th, we will be serving sandwiches from the Kickstand Cafe! If you've been to Kickstand, you know how delicious and healthy their sandwiches are. If you haven't, come try them out! Copyright © 2016-2019 Belmont Books, Inc.